Professors Amos, Bang, Fontaine, Gribb, Hansen, and Kenner; Associate Professors Christopher, Stone and Surovek; Assistant Professors Arneson-Meyer, Benning, Cetin, Fick, Nam and Robinson. 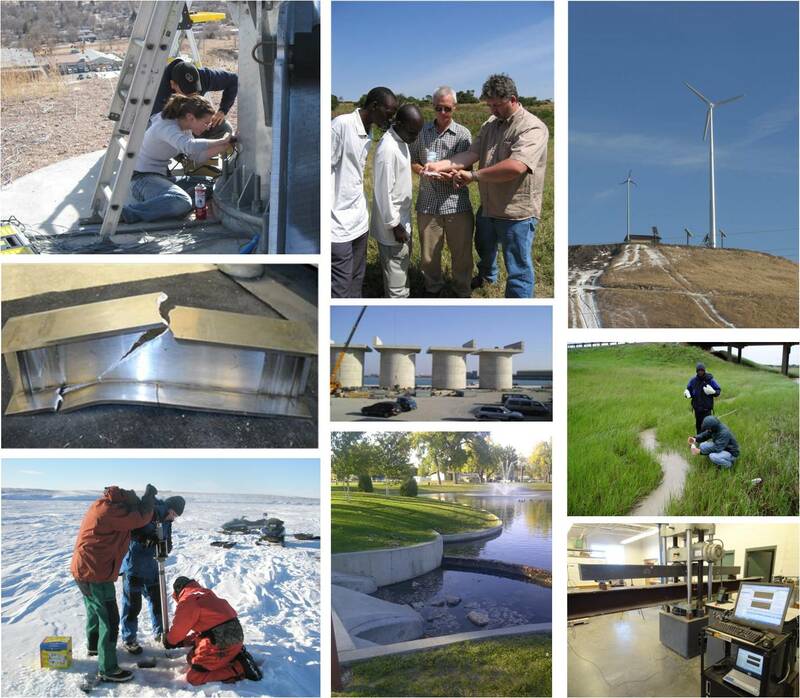 The Department of Civil and Environmental Engineering offers coursework and research opportunities leading to the Master of Science degree in civil and environmental engineering (MSCEE) in the following emphasis areas: advanced materials, construction management, environmental, geotechnical, water resources, and structural engineering. Students may specialize or take courses from several areas. A GPA of 3.00 or better is required of all applicants for the MSCE program. The Graduate Record Examination (GRE) is required of all applicants except School of Mines graduates. The TOEFL exam is required for students whose native language is not English. Incoming students should have completed three semesters of calculus, one semester of probability and statistics, one semester of differential equations, two semesters of chemistry and at least one semester of physics. Deficiencies in these areas must be remedied by taking the necessary coursework prior to, or in the first year of enrollment in the graduate program. All incoming students, including those without a B.S. degree in civil or environmental engineering, are also expected to have completed the appropriate background courses for their intended emphasis area. Additional subjects may be required by the student’s graduate committee depending on selected emphasis area. These requirements will be documented as a formal component of a student’s program of study. An accelerated Master of Science (B.S./M.S.) degree program is available for qualified seniors enrolled in engineering B.S. programs at the South Dakota School of Mines and Technology. The accelerated master’s degree program allows B.S. engineering students to take up to nine (9) graduate level credits to simultaneously meet undergraduate and graduate degree program requirements. For more information about background requirements or the accelerated master’s degree program, contact Dr. Scott Amos (Scott.Amos@sdsmt.edu). All rules and regulations of the graduate office, included elsewhere, apply to candidates for the degree of Master of Science in civil engineering. Thesis and non-thesis options are available. All full-time MSCE students are required to attend the CEE graduate student seminar series during the course of their studies. The MSCEE thesis degree option consists of program of graduate coursework and independent thesis research. Candidacy for the MSCEE degree with the thesis option is contingent upon the student’s aptitude to do research. The thesis must constitute an original contribution to knowledge in civil and environmental engineering and must be successfully defended at a final oral presentation and examination. Students are accepted into the MSCEE thesis option upon the successful submission of a written thesis proposal, public presentation, and the recommendation of a major professor. A program of at least 31 credit hours of coursework and research. At least 50% of the credit hours must be at the 600 level or higher. At least 15 credit hours of CEE approved graduate coursework (500 level courses and above) to include Research Methods (CEE 500 ). Independent study (CEE 691 ) and Non-thesis Research (CEE 788 ) are not applicable toward the thesis option. At least 6 credit hours of thesis research. No more than 6 credit hours of thesis research will count toward degree requirements. Completion of a satisfactory thesis based upon independent research. A program of at least 33 credit hours of course work, of which no more than 3 credits may be from CEE 691 , CEE 788 , CEE 790 , CEE 791 , CEE 798 , or CP 697 . At least 50% of the credit hours must be at the 600 level or higher. At least 20 credit hours of approved CEE graduate coursework (500 level courses and above). Developing thermally resistant composite materials for extreme environments. Developing stronger, lighter, and more corrosion resistant aircraft components. Determining the fate and transport of mercury and arsenic in the environment. Developing geo-biological dust control techniques for construction or waste sites. Life cycle assessment modeling to prepare agricultural processes for a carbon-constrained and sustainability-aware marketplace. Investigating the influence of unsaturated soil characteristics on pavement systems. Evaluating response of turbine structures to wind loads. Developing a sustainable stormwater management program for the Pine Ridge Indian Reservation, South Dakota. Characterizing transport of phthalate plasticizers in building materials leaching into the air and adsorbing to particles. Improving the sustainability and evaluating the environmental suitability of geotechnical structures built with waste materials.